What's the biggest thing investors screw up? I've thought a LOT about that question. And I know that the answer will help a lot of folks avoid big losses. Most investors have no idea when to sell. This is a tough realization for many. When you're clicking "buy," you don't want to stop and think through what would cause you to sell. It's exciting to make an investment... No one wants to kill the thrill with the homework of selling. The problem is that a great trade is made up of two things... a great buy and a great sell. The biggest thing investors screw up is only worrying about the buy. But you can solve this problem with a simple step. 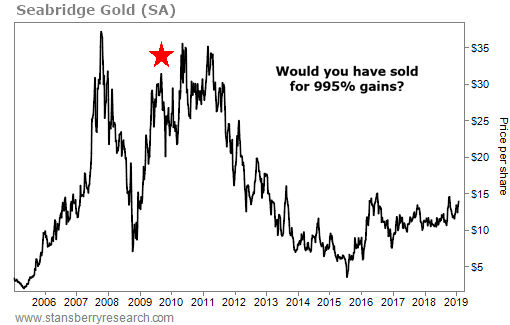 Seabridge Gold (SA) is, to this day, the best-performing stock recommendation of my career. I recommended it back in July 2005 in a high-priced, speculative newsletter I used to write. Shares of this best-in-class gold explorer went from around $3 to more than $30 by the time we sold in 2009. Subscribers who followed my advice locked in a 995% gain. Today's price is 50%-plus below where I told readers to lock in profits back in 2009. The problem is, I know many folks never sold. I've spoken to dozens of readers at conferences who bought Seabridge on my original recommendation... and held on to it years after I recommended selling. They rode it all the way up... and all the way down. Our subscribers at Stansberry Research often take our buy advice... But for some reason, they don't always sell when we say sell. Now, that's fine... if you have a different exit strategy that happens to work for you. Either they don't want to sell when they're up because they think more gains are coming, or they don't want to cut their losses when they're down. Sometimes "holding and hoping" might work for you – by chance. The problem is, "hanging in there" is not an exit strategy. If all you're doing is hoping, you have no control. You are not investing based on risk and reward. So the day you enter a trade, make sure you know what will cause you to exit that trade. I believe we'll see a furious blow-off top in the market in the coming months. But I also know that the "Melt Down" that will follow could be swift. That's why I use stop losses to know when it's time to sell. All this means is choosing a point where you'll exit the trade. You can use a hard stop at a specific price (for example, a recent low). Or you can use a trailing stop that follows your investment as it rises. I often use a 25% trailing stop loss for my investments. That means if the stock falls 25% from its high, I sell – no questions asked. It doesn't matter which kind of stop you use. What matters is having a plan to sell... and sticking with it. That's how we'll hold on to our Melt Up gains. And if I'm wrong about the Melt Up entirely, we're covered, too. So make sure you have an exit plan for every investment. And don't go against it... If you do, you will always come up with an excuse not to sell. P.S. I believe this idea is so important, I'm joining my friend and colleague Dr. Richard Smith at his latest big event... the 2019 Bull vs. Bear Summit. Richard built his career on helping investors sell when the time is right. Now, he's teaming up with some of the best minds in finance... to discuss what's next for this historic bull market. I can't wait to share my most up-to-date thoughts on the Melt Up. You can watch this free event online on February 13 at 8 p.m. Eastern time... All you need to do is sign up right here. "Just about any time you have a complex scenario with a wide range of outcomes – which is certainly the case with investing – this technique has value," Dr. Richard Smith says. Learn more about the strategy that world-class investors use to make better decisions right here: Boost Your Odds of Investment Success With This Simple Technique. "Is there such a thing as a foolproof investing system?" Richard asks. "After nearly 20 years of research and firsthand experience, I believe that I finally have an answer." Get the details on his eight-step plan to protect yourself from investing pitfalls right here. 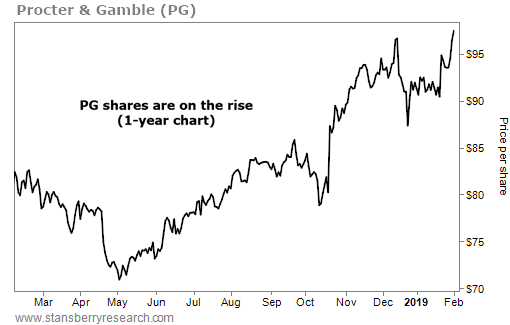 Procter & Gamble (PG) is a $245 billion consumer-goods powerhouse. It sells well-known brands like Tide laundry detergent, Bounty paper towels, Old Spice deodorant, and Crest toothpaste. Thanks to these products’ brand recognition, most consumers won’t stop buying them even if the company raises prices. That’s exactly what the company did recently – and it’s paying off… In the latest quarter, Procter & Gamble beat expectations with around $17.4 billion in sales. About 1% of its sales growth came from higher prices.